In the laboratory, the measurement of different properties require samples to be prepared in different ways. To create geological models, numerous samples are required and such activity becomes invasive, cumbersome and expensive. Digital rock physics (DRP) is one way to mitigate this problem. The method consists of simulating laboratory tests on digital models created with information captured from actual rock samples. We have been focusing on collecting our models with computed tomography (CT). From Ramos et al., 2018. An x-ray source emits a beam through a sample. The x-ray attenuation in space is recorded by a detector. Conventional DRP considers each pixel (or voxel, in 3D) in a CT derived image, and assigns it to a physical object. In the case of a rock, this can be a mineral, or pore space. Here is an example: On the left is a 1.4mm x 1.4 mm image, with units in "CT number". Attenuating areas (light colour) are assumed to be denser, and assigned mineral properties. Less attenuating areas are assigned properties of air. This process is known as segmentation, and has several problems. First, we typically need to know the density and porosity of a physical sample to make sure the model matches. Second, because we assign voxels the properties of pristine minerals, we tend to over predict certain physical properties. Our group has introduced a new DRP workflow that does not involve rounding each pixel or voxel to be that of a mineral or pore. The method works by preserving the variation in CT number recorded in each voxel, and converting it directly to a density and elastic property. We can do this by scanning a rock alongside physical targets of known density. 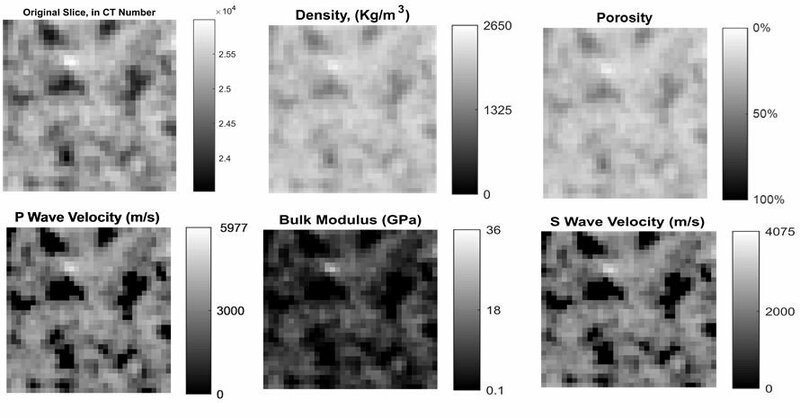 Left: a scan of a rock cylinder is taken with "targets" of known density. Right: this histogram shows regions/peaks, that are related to each target. If the CT number is paired with a density value, we can create a function indicating the relation between CT attenuation and density values. Conversion curve between CT values and density. We can now convert the model to density. We have created a workflow to estimate porosity and wave velocity in samples as well. This can be found in the "selected publications" section of this website. 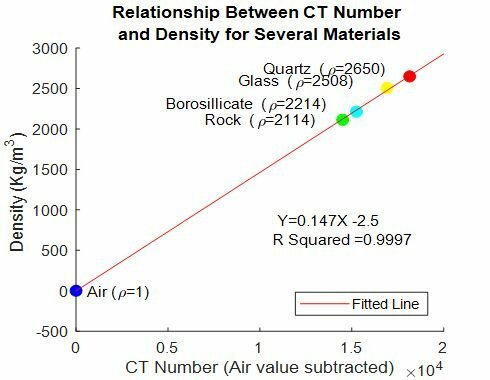 We can convert our CT model into models of other rock and elastic properties. We have been working on solving rock properties for large core, which will make it cheaper and easier to interpret them. We have also been working with millimetre sized pieces of rock, which are analogous to rock cuttings (small pieces of rock that break off during drilling). We have found that these small pieces match larger core from which they are extracted. Using conventional methods, it has been impossible to measure values for cuttings before now. 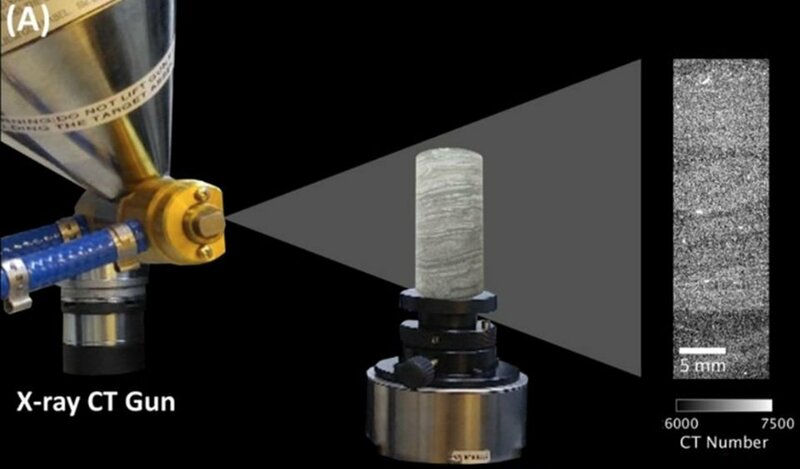 This method will also allow us to understand rock properties from samples which rare, fragile, or not in a position to cut. This includes rare core, space rocks, or other museum quality pieces.